Today, on championship Sunday at the 2019 HEAD U.S. High School Team Squash Championships hosted by Trinity College, three Deerfield teams are each ready to compete for a podium finish at the event. The Deerfield boys JV squash team, playing in the 16-team third division at the event will be battle The Hill School at noon today for the top spot in their bracket. En route to today’s championship game, the squad defeated Horace Mann 6-1 in the opening Round of 16, then went on to defeat Germantown Friends 5-2 in the quarters and finally, they defeated Tabor Academy 4-3 last night in the semifinals. 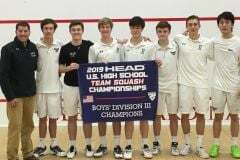 Competing in the top division at the National Championships, the boys varsity squash team went undefeated in their opening two matches at the tournament, defeating McDonogh (4-3) and Brunswick School Varsity B (5-2), before falling to Brunswick School (0-7) in the semifinals yesterday afternoon. The squad will look to build upon their momentum in today’s bronze medal match vs. St. Paul’s. The Big Green recently defeated the Pelicans, 6-1 in a regular season contest at St. Paul’s. The bronze medal match is set to start at 1:20pm today. Also competing in the top division at the National Championship tournament, the girls varsity squash team will look to earn another win this afternoon when they face off against Baldwin School in the bronze medal game today at 4:00pm. 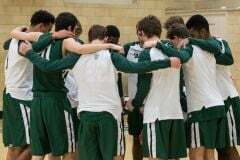 In the opening round of 16, the Big Green defeated Penn Charter (6-1) and avenged an early season loss to Choate (5-2). Eventually, the Big Green fell to Greenwich 6-1 in the semifinals yesterday afternoon. View yesterday’s footage, by clicking here. Good luck to all three teams competing today!